How to make cake pops? 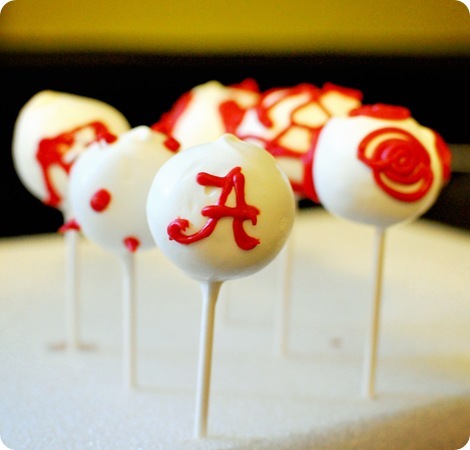 Cake pops is a type of cake that everybody loves because it is a small cake that is on a stick, similar to a lollipop. You can make it from crumbs of cake and mix with chocolate and icing made into round shapes that makes them look like cake balls. They are easy to make and people have started to make them since the last few years after they gained popularity. If you are new to making sweets and desserts, do not worry because they are simple and you need to follow few steps. They are made for many occasions like baby showers, bridal showers, kid’s parties, anniversary and celebrations. Some people make it to have themselves or share with their friends. There are many types and you can make them anyway you like. You can even make with pumpkins during Thanksgiving and Halloween. Step 1: Get a small bowl and pour the chocolate and add the whipped cream. Step 2: You need to make sure that the bowl is microwave safe and it can withstand heat. Set the microwave oven to one minutes. This is not to make the mixture hot but to melt them into a liquid form. Do not put two minutes at the same time. First of all, give one minute. Take it out and use a fork to stir. Put it back in and wait another minute before you stir again. Step 3: After taking it out for the last time, give it a good stir. You should not put the time to two minutes at once because you will burn the mixture. Be sure there are no bulges or lumps. Keep it aside. Step 4: Get the chocolate cake. You can use your food processor an unless you do not want to use it you can make the crumbs using your hands. Wash your hands and rub them dry. A single drop of water can cause trouble so it is wise that you let your hands completely dry. Now, tear up the cakes into small pieces or rub two cakes together which is kind of like how the people of the past rubbed two stones to make fire. Step 5: This is a bit difficult step because you have to add the chocolate mixture with the crumbs in a bowl make sure the consistency is perfect for you shape them into spheres. Start with half of the mixture in all of the crumbs and stir with a spoon. After stirring for a long time, take some amount to test if you can make them into balls. Step 6: Take a flat plate, and make them into round shapes and keep them in the refrigerator for at least twenty minutes. It will make them solid. You need to dip the sticks into the chocolate mixture and insert the stick through the ball. Dip the ball in the mixture and add sprinkles and M&M. This entry was posted in Food on October 16, 2017 by Tom.